Do you have a sermon in you? Would you like some help to get it out? It’s been said that every person has at least one sermon in them! Explore the possibilities of in this workshop sponsored by the Worship Team and led by Rev. Connie Grant. We are hoping to spark some ideas and to offer some tools to help you develop your thoughts and experiences into a sermon proposal. There are open slots in our worship schedule for June, July, and August, available for lay-led services. You don’t have to commit to actually doing a service in order to attend the workshop! Please contact Sarah Nuss-Warren at nusswarr@gmail.com or Rev. Connie Grant at constance.l.grant@gmail.com with any questions. Register here by April 10. The Lifespan Religious Education Team meets monthly to support and develop the religious education program at the Fellowship. If you are interested in helping on the team or just interested in knowing more about what we do, feel free to attend our meeting and see what it is all about! Contact Heather Cleland-Host, dreheather@uufom.org for more information ahead of the meeting, especially if you are interested in joining the team. Would you like to get involved in an outreach activity that can help you live your values? UUFoM is involved with Home to Stay (formerly Midland Area Homes), an organization that helps Midland County residents in need sustain stable housing through education, advocacy and support services, and promoting self-sufficiency. Every few months, we do our part by volunteering to pick up furniture from the area that people (like you!) donate to the organization. The pickup is always on a Saturday morning, and we often go out to lunch as a group after the pickup. The only requirement is a moderately strong back. We do get some heavy items from time to time. Our next pickup is on April 13th. Future pickup dates are July 27 and Oct 26. If you are interested in volunteering to be part of this important work, please contact Kevin King. We need help in the kitchen on Friday, April 12 to prepare pasties for the Pasty Sale on Sunday, April 14. Responsibilities include cutting vegetables, blending the filling mixture, making crust, assembling the pasties, timing the pasties in the ovens, wrapping finished pasties, doing dishes and cleaning the kitchen among other jobs. Six or more per shift will work out well. You can sign up on the sheet at the Fellowship. In the past, this fundraiser has been successful in part because the ingredients and supplies have been donated. Please have all ingredients to the Fellowship kitchen by Sunday, April 7 with the exception of the ground beef and pork. The ground meat (FRESH – NOT FROZEN) should be at the Fellowship in the refrigerator by Friday, April 12. You can sign up on the sheet at the Fellowship. Please fill in the date when you deliver items to the kitchen. 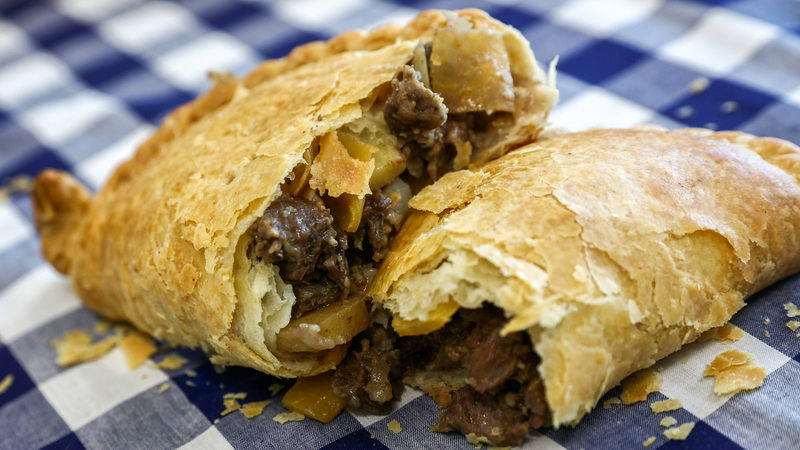 Click here to place your order or sign up in advance at the Fellowship to purchase Traditional (beef and pork mix) or Vegetarian (lentils with olive and sesame seed oil) Pasties for $5 each! The Search Committee is pleased to announce that we have selected a ministerial candidate. We have followed the advice we received near the beginning of this process to “fall in love” with the candidate. We hope that you will, too! We are unable to give you more information now until some final details are attended to, but will fill in the blanks as soon as we are able. In the meantime, we are making arrangements to introduce them to you. Candidating Week will be April 28 to May 5. The candidate will present a sermon on each of the Sundays. During the week there will be opportunities for you to meet the candidate and their spouse. We’ll be arranging meetings with committees and other groups within the Fellowship as well as “cottage meetings” in the homes of individual members. If you would like to host one of these cottage meetings, please contact Maxine Guettler, at Guettler@chartermi.net. After the service on May 5, we will excuse the candidate and vote on whether to call them. We hope this will be the beginning of a joyous partnership as our Fellowship moves into the future. The UUFoM Endowment Committee will update the Fellowship on the status of the Endowment Fund throughout the year. The Endowment Fund ended 2018 with a balance of $178,000. $30,000 was taken from the fund in 2018 to help pay for the drainage and resurfacing of the parking lot. The balance has improved somewhat since the beginning of 2019, but not enough to make up for the Endowment Fund’s payment to the parking lot fund. In 2018 the Endowment Fund received donations totaling $700. At this rate, the fund will take time to recover. In addition to the possibility of designating the fund as part of your will, please consider making an annual donation of $100, $500, $1,000 or more. In order to help with projects not covered by the budget, we need to continually keep growing the Endowment Fund. Presented by Sara Clavez, Shannon Sonoras, and the Rev. Connie Grant. This two hour workshop will deepen our understanding of UU history, traditions and current practices as well as looking at how all of this affects the ways in which we do UU lay leadership. The Engagement Team is offering workshops based on the Harvest the Power program developed by the Unitarian Universalist Association. Harvest the Power is a series of workshops designed to provide leadership skill development that goes hand-in-hand with faith development. Through discussion, art, play and introspection, the program helps lay leaders grow in spirit as they grow as leaders. Harvest the Power addresses the reality that today’s leaders operate at a time of rapid cultural change, both in and outside our congregations. Leaders need a broad range of skills, both technical and visionary. Whether you are new to congregational leadership or an experienced leader in our congregation, these workshops offer opportunities to enrich the skills you bring to your leadership and will raise awareness of how you and others experience leadership as part of your Unitarian Universalist faith journey. There are no prerequisites, no obligation to participate in all the workshops and no cost to you for participating. We do ask that you preregister so we can have enough copies of the materials for all participants. Minimum 8 people by Thursday, April 11. Sign up here by Thursday, April 11. Register here by April 10 to attend the workshop. Congratulations! We are all new parents! That’s right, we’re adopting a road! Our bouncing baby is the west side of Eastman Road from the north fairgrounds entrance to Monroe Road – that includes all of the Midland City Forest frontage on Eastman Road. We’ll meet in the Fellowship parking lot on Saturday morning April 13 at 10:00am, then carpool to the site, returning to the Fellowship at 1:00pm for pizza and sharing of sordid litterbug tales. To maximize benefits for the Fellowship, be sure to wear a UU T-shirt if you have one! And we will get two road signs acknowledging our adoption. Participants must be at least 16 years old, dressed and ready for hard work (including work gloves). For more details and/or to confirm your participation, contact Jim Crissman at jwcrissman@gmail.com or 989-297-3009. Beginners’ Tarot Class, hosted by CUUPs, is a series of classes (4) taught by Kelly Resendez Bailey. Kelly is an ordained interfaith minister of 20 years and has been teaching pagan study groups 30 years. She is also the High Priestess of the Mystic Sisters Coven and has been serving as a mentor of several covens over the tri-state area for over 15 years. She has over 40 years of Tarot experience. Cost is $20 for the series or $5 per class to pay for the instructor’s gas, supplies, and time. If you cannot pay, please come as we want this class to be open to everyone.